I bought this unit from eBay as a DC 5V USB Battery Capacity Tester / Battery Life / Internal Resistance Analyzer . It's a ZH-YU ZB106+ v1.3, and it's still available from a variety of sources. Mine is 5v USB powered, though a version exists that runs on straight 12v. 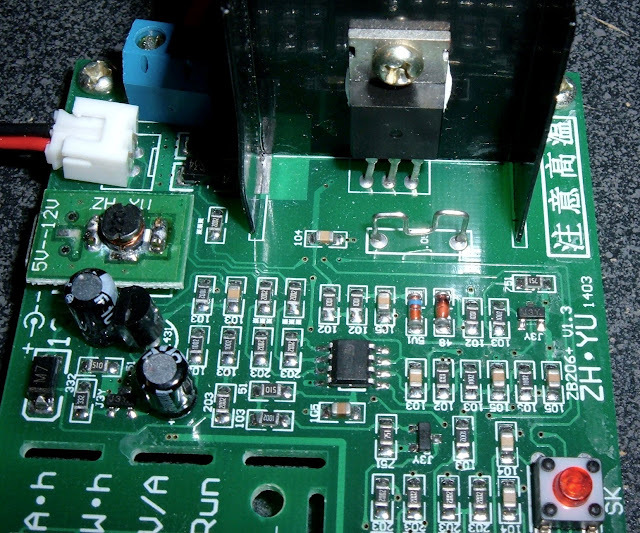 The USB version has a 5v to 12v boost converter for power (the small square labeled "5V--12V"). It's an excellent unit, and I'm quite happy with it! This is my "go-to" unit for battery measurements now. A major part of this is because it supports four wire measurement and measures watt-hours in addition to amp-hours, and supports from 0.1A to 2.6A in 0.1A increments. It's much more configurable than my other units. As always, if you're interested in such things, read on. 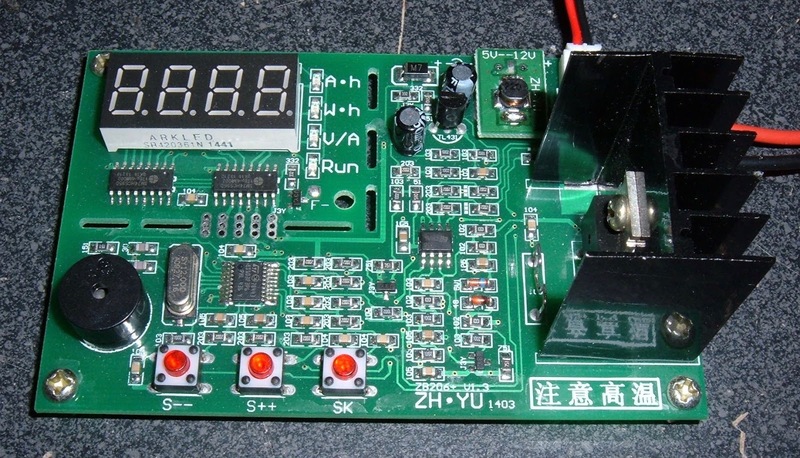 This is another semiconductor based battery tester, similar to the TEC-02 I tested a while ago. 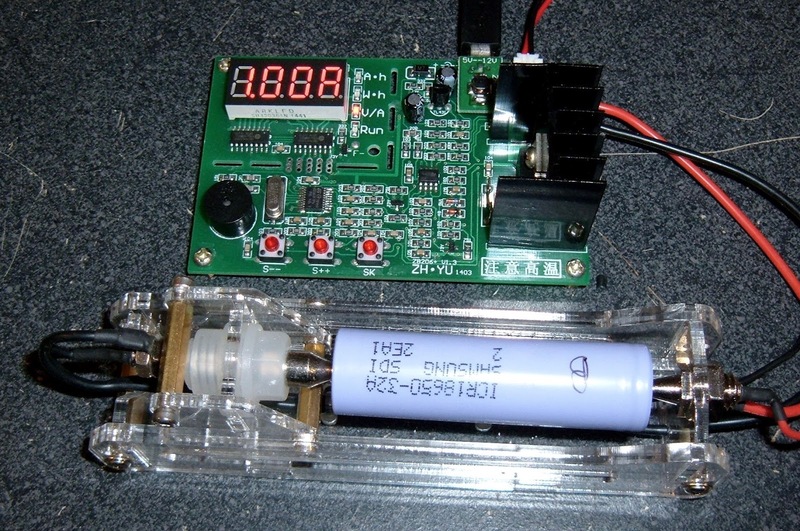 Instead of using a fixed ohm load, this type of tester uses a semiconductor to drain the battery. The fine grained control means that if you specify a 1A draw, it draws 1A, regardless of the state of battery charge. The heat is dissipated in the semiconductor, which has a large heatsink attached to it. Of the units I've tested so far, this is the highest quality in terms of construction. 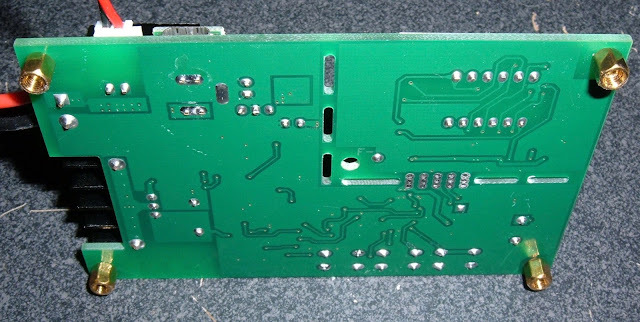 The board is well assembled, with high quality solder joints. It has two connections for the battery battery: Two screw terminals for the discharge current, and a small two pin terminal for use with the four pin test mode. I'm still not sure what connector style the additional pins are, but I've got something that sort of works. The manuals I've found for this unit are very poor. I'm not even going to bother to try and translate all of it, because it's just pointless. I'm going to borrow the parts I need and write my own. http://powercartel.com/teardowns/zh-yu-zb206-battery-tester/ is a most useful reference for this device, and has helped me fill in the missing parts of other manuals I can find. Power supply: 3.5-5.5v, less than 70mA. Do not use a laptop or desktop for power, use a standalone charger. - Two line batch mode: Cuts off the discharge current during battery voltage detection to prevent line losses from affecting the measurement. The test cuts the current for a few milliseconds to measure terminal voltage rather than load voltage. - Four wire mode: With a special fixture, the battery can be accurately tested. 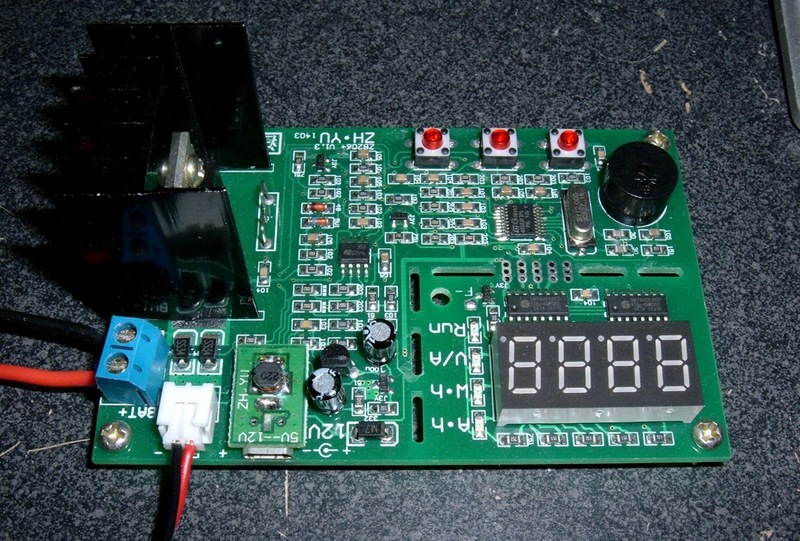 - Internal resistance mode: The unit can detect battery internal resistance with a 4 wire harness. These are the types recognized in automatic battery detection and termination voltage setting. It supports 17 battery types in 13 voltage categories. To enter the configuration menu, power the device on while pressing the "SK" button. If you've done it right, you'll see "LJ 4" on the screen. To change the options, use "S--" and "S++". To select the next option, press "SK". Once you've gone through all the options, you'll be back in the normal operation mode. The "LJ" setting is for the tester mode. If you have only the two main wires hooked up, set "LJ 2" for two wire mode. If you have a four wire test harness, set "LJ 4" for four wire mode. Most features work fine in both modes, but accuracy will be somewhat better with a four wire test harness. If the unit is set to "Auon" (Automatic On), it will try to detect the battery type based on the starting voltage, and set the termination voltage automatically. If it is set to "Auof" (Automatic Off), it will require the user to select the termination voltage before starting a test. This sets the end of test beeper to on ("bEon") or off ("bEoF"). If this is set to on ("LPon"), the unit will not allow more than 10-12W of power to flow. In order to exceed this limit safely, a fan must be blowing over the unit. This can either be a fan powered by the unit, or an externally powered fan. When the power being dissipated is larger than this value (in watts), the fan will turn on. If it's set to SF00, the fan will always be on during discharge. In order to use the automatic fan control, connect the proper fan to the incoming voltage, and ground it to the "F-" pin just below the "Run" LED. Err1: Battery voltage too high. Ensure battery voltage is below 8.5v. Err2: Battery voltage too low (below set termination voltage). Err3: Battery sagging too much - cannot supply requested current. Ensure the conductors are large and tight, otherwise use a lower current setting. Err4: The semiconductor is damaged. Replace it. Err5: Power limit exceeded (see LP setting above). Err6: Power supply voltage out of range. Power it on and insert a battery into your test rig. You'll see "1.00A" on the display. This is the discharge current. "S--" and "S++" adjust it in increments of 0.1A. Set your desired current. Press "SK" and if you have automatic voltage setting on, things will start. If you have automatic voltage setting off, you can now set the cutoff voltage. It shows what it thinks you should use (perhaps P3.0v for a fully charged lithium cell), and you can adjust as desired. Press "SK again, and the testing starts. The "Run" LED comes on to indicate it's discharging. Ah: How many amp-hours have been provided. Wh: How many watt-hours have been provided. V/A: Shows both the current voltage and the current amperage. "SK" does nothing during the test. If you press "S--" or "S++" during the test, it will cancel the test and allow you to reset the amperage/cutoff voltage. However, it resets the measured capacity. Once this startes testing, you shouldn't muck with it. Once the battery has dropped to the cutoff voltage, the display will flash to indicate the test is complete. Press "S--" or "S++" to cycle through the various measurements: Amp-hours, watt-hours, and final voltage. Press "SK" to reset the unit and start another test. If you wish to test a cell's IR, power the unit on while holding the "S--" key. r000 will show. If you insert a battery into the test harness, it will show the calculated internal resistance in mOhm (so 056 means 0.056 ohms, or 56mOhm). If you press "SK" the display will toggle between the measured IR and the current battery voltage. One of my standard tests is to drain a few batteries and see how close the discharge capacity comes to my VC4 charger's charging measurement. The charging puts in slightly more capacity than the discharge (or very close) - the only major (0.1Ah) discrepancy is on Battery A @ 1A. I'm quite happy with these results. It's accurate to within my equipment, and certainly matches well to the other devices. This is a great tester. Beyond just amp-hours, it gives you watt-hours, which is useful for testing battery capacity at different draws. It supports a fan for higher power dissipation, and is generally a well constructed unit. If you need a tester, this is certainly the one I'd buy right now! Where on earth did you get the little socket for the 4 wire test? I'm using a connector that isn't quite right on my test rig, but I have a bunch of the proper connectors now. Of the capacity meters I've tested, this is the one that gets all the use at this point. I don't bother using the others anymore. Final price 6.29USD paid trough the mobile app. Nice!!! Thanks! Many thanks for the review, I have the 12v edition and works ok. Thank U for your information. It is very helpful to me. For IR mode, 4 wire harness is necessary. What is "4 wire harness"? connect "Bat+" with "bV+" to the (+) of test battery, connect "Bat-" with "bV-" to the (-) of test battery? Do a search for "4 wire battery testing" and you'll get more information. Basically, you separate out the voltage sensing wires from the current wires. There will be some voltage loss across the current carrying wires, and in 2 wire mode, the tester only sees the voltage at the tester terminals. With a 4 wire setup, there are two additional wires that go to the ends of the battery - so they can report the voltage right at the battery terminals. Any good battery test harness or holder should have these wires. The connector for the 4-wire measurement is a JST-XH 2.5mm 2-pin. It's the 2-wire version of the standard JST-XH Balance connector on every single Lithium pack. Easy to get... http://www.ebay.com/sch/i.html?_nkw=JST+XH+2.5+2-Pin+&_sacat=0 HOWEVER, the standard wiring has the Pos and Neg reversed. So, remove the connectors from the shell and swap them over. OK I bought one of these to test some scrap 18650's and after I ordered it I luckily found this page. Question I'm testing and old 5v power bank and as it cycles thru the LEDs under volts it says 5.17u. Not sure what the "u" stands for. The "u" is a very poorly rendered "V" - it means volts. Any thoughts on the Fan control. I have read the small pad on top of the 5v to 12v boost converter was +5V and then I would connect the negative to the F- hole. I just happen to have a few 1" 5v fans. That sounds about right. I don't use the fan on mine - I've got other testers I use for higher current loads. For my first run I set it for .200 Ah and felt a little heat testing . Next test I bumped it up to .500 and it was getting pretty warm. Almost too warm to hold comfortably. And like I said I already have the perfect little fan. Thank you for this write up!! I have 4 of them and was trying to get them into the other modes and just could not till i read your post. just a note the fan is set to run at 12 volts. That may seem like a no brainer but before i ordered 4 up i just had to check. Anyone know of a the real world watt limit/discharge amps with a fan? Theoretically it will tolerate 8.5V and 2.6A, though I haven't tested it up there. That's a good bit of power for the somewhat crappy heatsink, and I don't use this unit for my high draw stuff - I have some higher power units (still need to review them) for that sort of work. Hello This is SuperBrainAK on youtube, I have 6 of these units for a cell discharger, I was wondering if you knew how to calibrate these? one of them is only off by 4.6% but getting that to 1% would be nice. thanks alot! ill be sure to share it with youtube also, with credit to you of course! I'm sorry, I don't know the details on calibrating them. I haven't found details on how to get into the calibration mode and I don't really read Chinese. Hello, sorry for my bad english... For you is more accurate this one or the ZB2L3 v2.0 ZHIYU? I don't use the ZB2L3 anymore. I use this and other related units. Well, other unit I suppose much expensive. I need this tester to make some order in my various battery.